Nacoa celebrates the 9th Children of Alcoholics Week in the UK from 12-18 February to reach out to the 1 in 5 children living with parental alcohol problems. COA Week is an international campaign held annually during the week in which Valentine’s day falls to raise awareness of the millions of children around the world being affected by parents who drink too much. We want children to know they are not alone and support is available. Every day of COA Week we will be sharing personal stories online. Reading other people’s experiences helps us to remember that we are not alone. Events include Nacoa’s annual David Stafford Memorial Lecture at the House of Commons on 15 February. Liam Byrne MP joined us to launch the first ever Manifesto for Children of Alcoholics. Priority for events is given to Nacoa Members and Volunteers. To raise awareness Liam and volunteer Josh spoke on BBC Breakfast. Calum Best, Craig Revel Horwood and Kim Woodburn are also among the many celebrity supporters of COA Week. 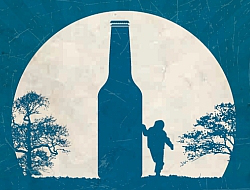 When alcoholism is the family secret, children battle with the fear of being disloyal to their parents and try to hide their problems from the outside world. This can leave children feeling isolated and alone. We want to see COA Week reach even more people. Media agencies, businesses, charities and the general public are all invited to get involved so that we can overcome the stigma surrounding this issue and break the cycle of addiction. See the press release for more information. There are lots of ways you can take part, from putting up a poster to downloading the charity single, posting on social media or organising a fundraising event. Visit coaweek.org.uk for more details and ideas of how to be involved. Simply being there and understanding can help people turn their lives around.